By Nicholas Cunningham - posted Thursday, 21 June 2018 Sign Up for free e-mail updates! 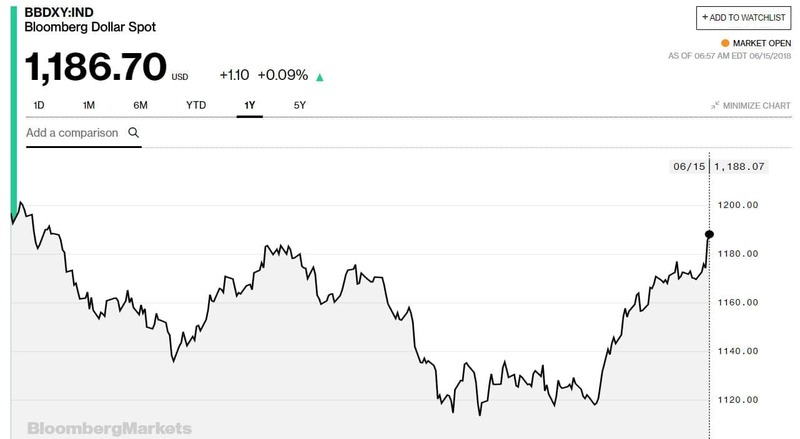 The US dollar has jumped to its strongest level in nearly a year, raising questions about how a strong greenback could act as a drag on debt and oil demand in much of the world. The US Federal Reserve announced another rate hike a few days ago, which helped edge up the dollar to a new high for the year. The greenback has "a little room to run," Kathy Jones, a New York-based chief fixed-income strategist at Charles Schwab, said in a Bloomberg interview. "We have seen softer numbers out of Europe and firmer numbers out of the US" The US Federal Reserve is unwinding its extraordinary monetary intervention after a decade of near-zero interest rates. The Fed has announced quarter-point interest rate hikes twice and is planning on at least two additional increases this year. "(ECB President Mario) Draghi came out a little bit more dovish than people thought he was going to be. And that really caused the euro to take a dip and the (US) dollar to go up, which is putting downward pressure on prices," Phil Flynn, analyst at Price Futures Group in Chicago, told Reuters. There are plenty of factors influencing oil prices right now, and the OPEC+ decision expected in a few days will be the single most important driver in the near-term. But the US dollar is one important variable influencing oil prices. A stronger dollar helps push down prices because it makes oil, which is priced in dollars, much more expensive in much of the world. The IEA said last week that oil demand is set to grow by 1.4 million barrels per day (mb/d) in each of 2018 and 2019, although that forecast was vulnerable to several potential pitfalls. "Of course, there are downside risks: these include the possibility of higher prices, a weakening of economic confidence, trade protectionism and a potential further strengthening of the US dollar," the IEA wrote. We have already seen some flashpoints flare up this year as a result of both higher fuel prices and currency problems, and while there are always multiple causes to such events, the strength of the US dollar cannot be discounted. In Argentina, the peso lost nearly a quarter of its value relative to the dollar, forcing the government to seek a financial rescue from the IMF. In Brazil, crippling protests over high fuel prices paralyzed the country – prices were particularly painful for the truckers staging the strikes because Brazil’s currency lost nearly 15 percent of its value relative to the dollar, exacerbating the rise in oil prices. "Currency risks are also mounting for several emerging market economies and some OECD countries," the IEA wrote in its report. "For example, between the start of April and the end of May, the Argentinian peso has depreciated by 24% versus the US Dollar, the Brazilian real by 12.6%, the Mexican peso by 9.7%, the Russian ruble by 9.2%, the Turkish lira by 14.4%, the South African rand by 7.3% and the euro by 5.4%." This currency turmoil threatens oil demand growth. "These depreciations forced some countries to increase interest rates to defend their currency, which could weigh on growth in due course," the IEA concluded.